‘Nobody else in the racing world has a personal story that so directly echoes the mechanics of motorsport – from building motorcycles in the 1940s to the running of a racing team in the 1970s’. Sebastian Vettel. Published to mark the 50th anniversary of John Surtees becoming Formula 1 World Champion, in 1964, this long-awaited book is a photographic memoir by the only man to have won World Championships on motorcycles and in cars. Containing nearly 300 photographs from Surtees’ own collection as well as from the world’s finest motorsport picture libraries, this major book presents a complete visual record of Surtees’ life accompanied by insightful commentary in his own words and is written in collaboration with co-author Mike Nicks. In motorcycle racing through the second half of the 1950s John Surtees was in a class of his own, winning seven World Championships on Italian MV Agusta motorcycles. Aged only 22, he became 500cc World Champion in 1956 and followed that with an incredible run of six titles – three each in the 350cc and 500cc categories – in the three years from 1958 to 1960. In his extraordinary 1960 season he accepted an impossible challenge – to anyone but John Surtees – of competing in both motorcycle grands prix and Formula 1 cars. With MV Agusta he won seven of 12 races entered and took his last two world titles. In Formula 1 he did six races and finished second with a Lotus 18 in the British Grand Prix, only his second World Championship start. As with bikes, by 1963 he was racing for an elite Italian team, Ferrari, in both sports cars and Formula 1. He won his very first race with Ferrari, the 1963 Sebring 12 Hours for sports cars, and in 1964 he became Formula 1 World Champion with a fine run of results as the season reached its climax – including forever winning the hearts of Italian fans with victory at Monza. Ever versatile as a racer, in 1966 he bounced back after injury in a huge sports car crash to win the inaugural Can-Am series in North America, driving a Lola T70. Then Honda recruited him to its new Formula 1 team for two seasons that saw him win the Italian Grand Prix again. His talents were not confined to being a rider and a driver. From 1969 his Team Surtees became a constructor, building 100 cars in a nine-year period and winning titles in Formula 2 and Formula 5000. 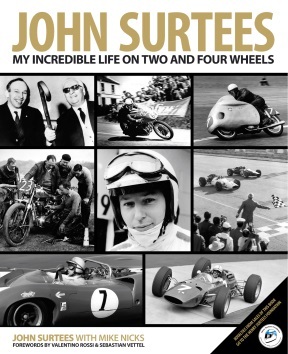 Royalties from sales of John Surtees: My Incredible Life on Two and Four Wheels go to the Henry Surtees Foundation, which was set up to honour the memory of John’s son Henry, who was killed in a freak accident at Brands Hatch in 2009.